Those lines still bring a mist to my eyes. 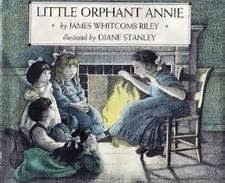 Oh, who is James Whitcomb Riley, you ask? Known as the Hoosier Poet, and the Children’s Poet, Riley was born October 7, 1849 in Greenfield, Indiana, a few miles east of Indianapolis. Over his lifetime, he authored hundred of poems, many inspired by his childhood memories of growing up in rural, small town Indiana, and written from a child’s point of view. 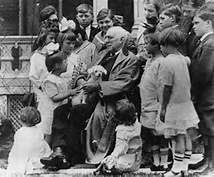 As a Hoosier, a poet, and the daughter of poets myself, I became aware of James Whitcomb Riley and his poetry at a tender age. I remember sitting and listening to my mom or dad read to me and my two siblings from one of their two volumes of The Complete Poetical Works of James Whitcomb Riley. Through his poems, Riley amused us with the antics of Little Orphant Annie and The Raggedy Man, turned us wistful and a bit melancholy with his reminiscences of The Old Swimmin’ Hole and Out To Old Aunt Mary’s, and he even scared us a little with The Nine Little Goblins. 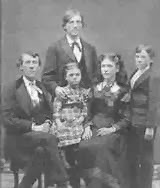 James W. Riley & siblings. on a German tramp James’ father hired to work around the Riley home. When his father returned from the war partially paralyzed, the family fell on hard times. 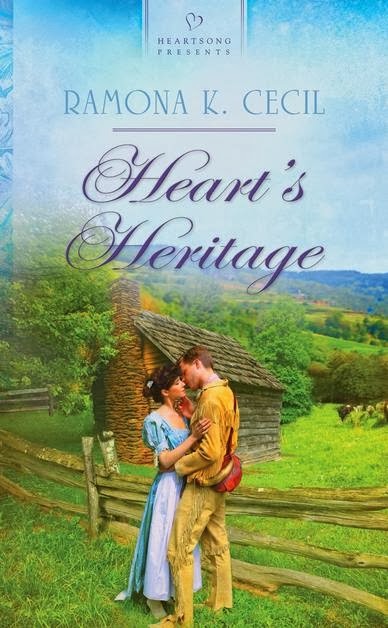 Though James’ first love was writing poetry, it brought in no money. In his early adulthood he worked as a painter, sold Bibles, and even patent medicines. In 1871, he started a business painting and maintaining signs on which, the advertisements were written in verse. During this time, he began sending poetry to his brother in Indianapolis. Acting as James’ agent, the brother offered the poetry to an Indianapolis newspaper for free. For a time, Riley joined in a venture with some friends, traveling around Indiana painting billboard-like signs on the sides of barns and other large buildings. Still, he continued to write his poetry, submitting it to newspapers and magazines with some success in sales. 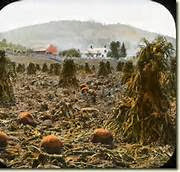 He solicited and received an endorsement from Henry Wadsworth Longfellow, which aided him in that effort. He worked as a journalist for several different Indiana newspapers, which allowed him to publish his poetry in their pages. In 1879, he took a job with the Indiana Journal. That job led to acquaintances who encouraged Riley to begin reading his poetry on lecture tours. 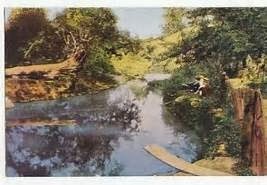 The tours proved both popular and profitable and led to the publication of Riley’s first book of poetry, The Ole Swimmin’ Hole and ‘Leven More Poems. Riley loved to read his poetry to children. Though he had serious, long term relationships with a couple different women, he never married; something he regretted in his later years. 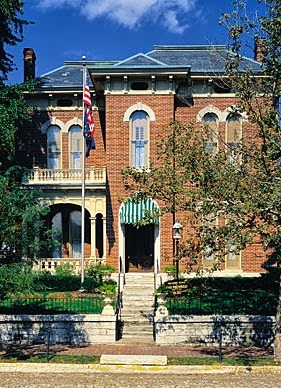 ﻿﻿For the last twenty-three years of his life, James Whitcomb Riley lived in a two-story brick home in the historic Lockerbie Square neighborhood of Indianapolis. 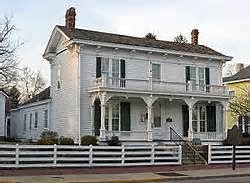 That home, and Riley’s childhood home in Greenfield, are now museums honoring the life and work of their famous resident. By the time of his death on July 22, 1916, James Whitcomb Riley was a much beloved, world renowned poet with vast fame and fortune. Of his many honors, the greatest is arguably is the Riley Hospital for Children in Indianapolis, named for him. This weekend, his hometown of Greenfield, Indiana will hold their annual Riley Festival in honor of their famous son. 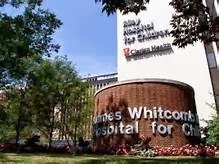 I had never heard of James Whitcomb Riley, but I will definitely be checking this out. Loved all the background information on him as well. Thanks for sharing! For some odd reason, your post just arrived in my in-box, Ramona. I'm so glad I didn't miss it altogether. I've heard of Riley all my life, but this short biography is very touching and informative. Thanks for sharing such a lovely story with us. 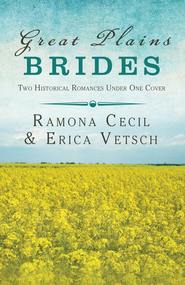 Hi Ramona, this was so lovely! I've never heard of James Whitcomb Riley, so it was a real treat to meet him and read his poem. Thanks so much for sharing. Hi, Carrie! As a Hoosier, I've just always assumed everyone is acquainted with Riley and his writing. Then I realized everyone doesn't live in Indiana. LOL Glad you enjoyed the post, and I hope you get a chance to read more of Riley's poetry. I am a Hoosier living in Texas. Thank you for bringing out James Whitcomb Riley's poems. Now I feel truly ready for Halloween! 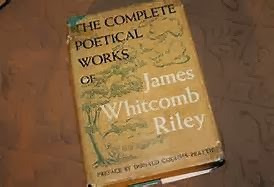 I grew up, knowing about James Whitcomb Riley, & his poetry, but never knew much about him. Thanks for the interesting post, Ramona!